How will the experience of the recent natural disasters impact on the work of Japan's artists? It's a question that is playing on the minds of many observers of the art world here these days, and it's a question that is somewhat answered — at least by way of historical parallel — in a show currently under way at the Edo-Tokyo Museum in Ryogoku. A year earlier, in 1854, the head priest at the Genkoin Temple (in present-day Shibakoen, Tokyo) had asked Kazunobu to create a series of 100 scrolls depicting the lives of the "500 arhats." 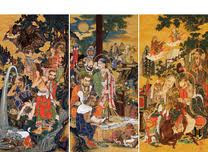 Needless to say, Kazunobu's experience of the earthquake of 1855 provided him with graphic motifs for his depictions of the fates of those who lacked piety. If it was fire and brimstone that was called for, then he had personal experience on which to draw. Kazunobu's images of hell are frightening in their detail. In one, a demon stokes a fire that heats a giant cauldron in which numerous unfortunates boil. They desperately reach up to grasp the staff of a benevolent arhat hovering above. Looking at these scrolls now, it is easy to see parallels with the kind of suffering that victims of the 1855 earthquake would have endured. Kazunobu would have known that his audience at the time would have its own memories of those experiences. And so in order to achieve the pictures' didactic objectives — "Stray from Buddhist teachings and this is how you'll be punished!" — all he would have had to do was provide enough visual clues to trigger images of the horrors imprinted in his viewers' minds. That said, curator Yamashita sees in these same images evidence of other influences, too. Kazunobu's renderings of people plunging into red molten pools have parallels with the renowned "Hell Scrolls" of the Heian Period (794-1185), he says. a 19th-century Japanese painter of the Kanō school. One of the last of the Kanō painters, Hōgai's works reflect the deep traditions of the school, but also at times show hints of experimentation with Western methods and styles. Like his predecessors, Hōgai painted a variety of subjects, but is perhaps most well known for his paintings of falcons, and of dragons. ... He also received the honor of having some of his works displayed at the 1876 Paris International Exposition. ... In 1884, Hōgai attracted the attention of Ernest Fenollosa, an art critic and collector from New England, who befriended him and bought several of his paintings. 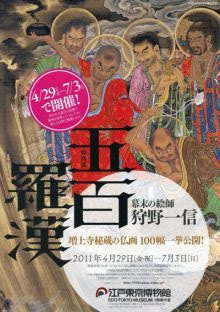 Along with Fenollosa, Okakura Kakuzō and Hashimoto Gahō, Hōgai then took part in a Painting Appreciation Society (観画会, kangakai). 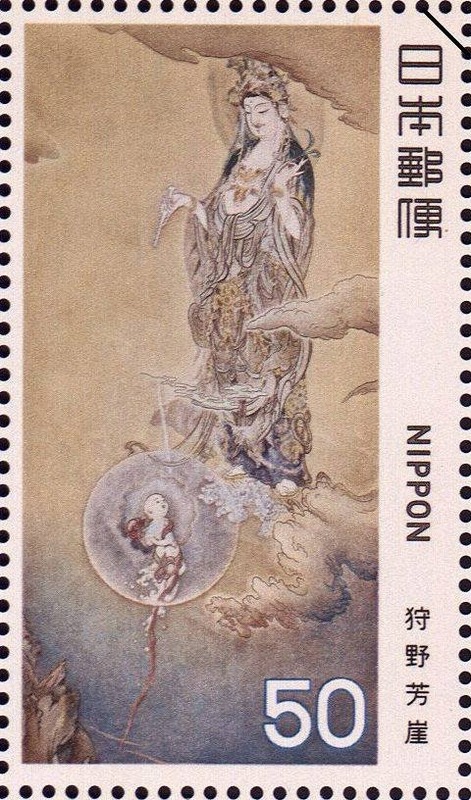 The final version does not show the usual "male" face of Kannon Bosatsu (as in his first draft) but a rather "female" version, because the painter had just lost his beloved wife while working on this painting, trying to incorporate oil painting techniques and colors with traditional Japanese themes . . .
First published in the Japanese art journal Kokka (Flowers of the Nation) a year after its creation. Merciful Mother Kannon (1888) by Kano Hògai (1828-1888) is today one of the most familiar paintings in modern Japanese art history, known both for its status as an early example of nihonga, or modern Japanese-style painting, and for the debates surrounding its production and iconography. With legends about Eitoku Hogen and the ema with horses.